An important public presentation about Google’s high-tech plans for a smart neighbourhood in Toronto will be held tonight, one in a series of planned consultations that organizers hope will address concerns and issues raised about the techno-enabled urban revitalization proposal. Quayside, the proposed smart neighbourhood near Queens Quay East and Parliament St. in Toronto, will also be a test lab for big data analytics. Image from Waterfront Toronto. 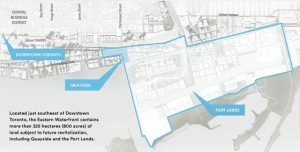 A highly connected, data-fuelled, nearly self-contained neighbourhood is proposed along the eastern waterfront by Sidewalk Labs, a sister company of the search engine giant. Called Quayside, the smart neighbourhood near Queens Quay East and Parliament St. will also be a test lab for big data analytics, where cutting edge technologies will be integrated into almost all daily activities, from work and play to shop and sleep. 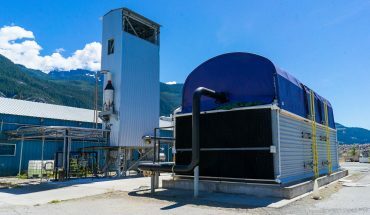 The community will be fully connected by high-speed broadband; micro-sensors will continually track and monitor things like traffic flow, garbage and waste accumulation, building performance and energy use. A fleet of robotic delivery vehicles and self-driving cars will transport people and goods around the high-tech ‘hood. 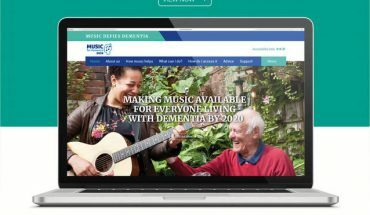 There are calls for a smart payment system to allow residents to pay for products or services with a single click on their device of choice. The Quayside community will be fully connected by high-speed broadband. Illustrations from Waterfront Toronto. 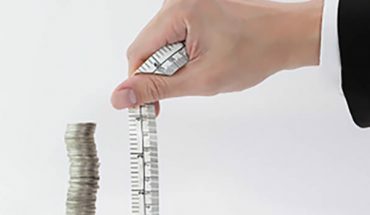 In a city that may be something like a smartphone connected to a social network and loaded with apps, the collection and use of incredible amounts of data will be the community’s lifeblood, with management decisions, economic developments, urban policies, community procedures and citizen activities guided if not dictated by big data analysis. It seems obvious privacy concerns are also embedded in the sidewalks of this smart city, and previous public consultations about Google’s plans have given many people an opportunity to voice them. From the sheer amount of data that could be collected in this highly sensor-ed city, to the protection and safe storage of such data (and what country the data is stored in: Sidewalk Labs itself is based in the U. S. and the information it currently collect through its websites, for example, is governed by laws in the U.S., where Canadians may not have the same rights and protections), to the potential monetization of such data and its sale to or sharing among Google’s third-party partners, public concerns have so far been acknowledged but not quite assuaged. Google’s public sector partner on the proposal is Waterfront Toronto, the tripartite government agency which has already implemented and overseen much redevelopment along the lakeshore. 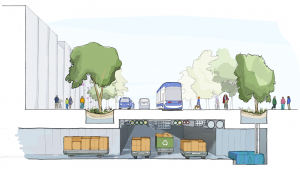 A fleet of robotic delivery vehicles and self-driving cars will transport people and goods around the high-tech ‘hood. Waterfront Toronto says it will make sure Sidewalk Labs clearly explains the how, when, where and why of its data collection plans, including safe storage in this country. While Quayside data will not necessarily be shared automatically with Google itself, many of Google’s subsidiaries and partners are involved in the project plans, such as the autonomous vehicle company Waymo, not to mention its mapping or cloud storage service. Sidewalk Labs says it will spend $50 million on its initial planning and testing for the urban development. 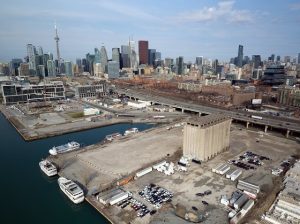 Waterfront Toronto also says the project is “a testbed for emerging technologies, materials and processes that will address these challenges and advance solutions that can be replicated in cities worldwide.” Sidewalk Labs will let third party developers access the data and technologies so as to improve or enhance their products, and Sidewalk says it expects to license the technology it produces for use in Quayside to other smart cities. 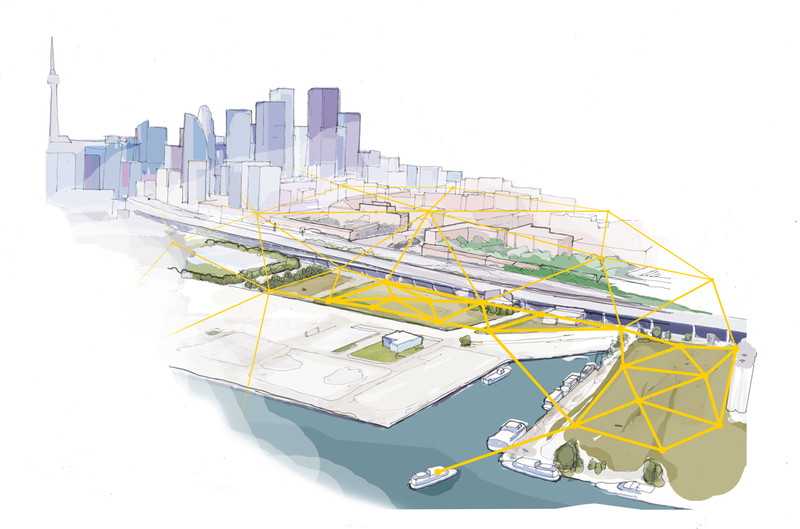 Knowing there are many smartphone apps and app companies that collect data about a person’s location history and travel patterns, and knowing the recognized problem and understandable concern is that such data often contains personal information, the Sidewalk Labs team is working on solutions. Replica, another of the sister companies in the Sidewalk Labs/Google/Alphabet orbit, has released a new software-based data analysis tool designed to de-identify and anonymize data so that it can still be used for planning, tracking, marketing and fulfillment purposes without jeopardizing the personal and private elements of that data. Replica is being built to support plans for Sidewalk Toronto, and the developers say they will share the tool with local Toronto researchers and public agencies to gather feedback and make it more useful. So the public talk tonight, April 24, and an upcoming public roundtable to be held on May 3, should be both lively and enlightening. Many attendees will have their own questions to raise; if not, there is a great list of some 35-odd questions compiled by Torontoist (the online publisher and community blog) about data security, business models, governance policies and more that need some smart answers. In response to stated concerns about data privacy and security, and as part of its overall mandate to protect the individual privacy rights of people who will live, work and visit Quayside, Waterfront Toronto has now formed a Digital Strategy Advisory Panel. The arms-length body is intended to help guide Waterfront Toronto on how best to incorporate data privacy, systems, and how to ensure the safe and ethical use of new technologies in the next phase of waterfront revitalization. The mandate of the Panel is to provide Waterfront Toronto with advice on the ethical use of technology, and the the protection of personal privacy, data governance and cyber security. The Panel is also charged with safeguarding intellectual property and data while encouraging innovation and economic development. Meetings of the Panel will be held on a bi-monthly basis and will be open to the public, according to the announcement. The Panel will hold its first meeting in May.